The men’s team is expected to return to the Storrs campus for a rally at about 5 p.m. today, followed by a student viewing of the women’s championship game. 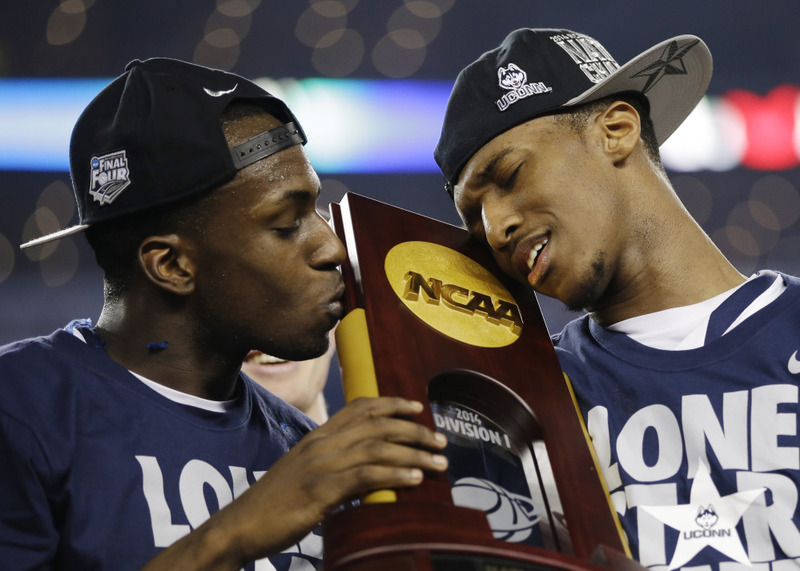 STORRS, Conn. — The University of Connecticut men’s basketball team plans to fly back home with the national championship that will be celebrated at a campus rally on Tuesday just hours before the women’s team plays for the national title. The Huskies beat Kentucky 60-54 in Arlington, Texas, to win the men’s NCAA title game Monday night, their fourth national championship. The team is expected to return to the Storrs campus at about 5 p.m. Tuesday, when a rally is planned at Gampel Pavilion. Gampel will remain open for a student viewing of the women’s championship game, which begins at about 8:30 p.m. The undefeated women are seeking a ninth national title when they play Notre Dame in Nashville. Back on campus, fans celebrating the men’s championship smashed a window in an engineering building, broke street lights and overturned furniture inside the school’s student union. Campus police made 35 arrests by Tuesday morning on charges including breach of peace, interfering with police and vandalism, university spokeswoman Stephanie Reitz said. Of those arrested, 20 were UConn students, she said. Most of the property damage was minor and no serious injuries had been reported, officials said. “By far, most of our students have conducted themselves safely and responsibly,” UConn police Chief Barbara O’Connor said. More than 10,000 students shook the stands inside Gampel, erupted in cheers and stormed the arena floor as the Huskies won their second national championship in four years. The victory comes a year after the Huskies were barred from March Madness because of grades problems. They never trailed in the final.